As in English, for the plurals of nouns (‘naming words’) normally add –(e)s.
Unlike English, words ending in -f or – fe simply add an -s e.g. wifes, leafs, lifes . When coming immediately after a number, measurement or amounts nouns don’t change in the plural , e.g. twa inch, fower fit, nine metre, ten mile, nor do meenit, oor (hour), month and year, but day, days. Some Scots irregular plurals are: ee, een (eyes); shae, shuin (shoes); wumman, weemen; coo, kye (cows); fit, feet and ox, owsen, child, childer not forgetting moose, mice; loose, lice; and goose, geese. As in English, some nouns are the same in singular and plural such as deer, sheep, troot (trout), cod, saumon (salmon), grouse, but in Scots so are gait (goat/s) and horse. Fish has two plurals, fish (a lot of fish) and fishes (a countable number of fish). Teeth the plural of tuith (tooth) is sometimes used as a singular. Parritch (porridge) however is sometimes a plural, and several nouns are only used in the plural e.g. breeks (trousers), galluses (braces), duds (rags or old clothes), shears (scissors). Often added to proper names e.g. Davie, Jeanie, the diminutive suffix -ie is also commonly added to short adjectives to indicate smallness as an alternative to the adjectives wee, bit or sma e.g. lass, lassie; kist, kistie (chest/box); hoose, hoosie; bit, bittie. Scots may have been influenced by Flemish/Dutch which has an even more obsessive tendency to add -je (pronounced ‘-ye’) to words e.g. een kopje (a cuppie – small cup), een reisje (a trippie – short trip). As in Scots there is an implied affection. The use of nouns like bit as quantifiers is actually quite common, but note they are not necessarily followed by o (of) e.g. a bit bried, a drap watter, a moothfu haggis, though eneuch is followed by o.
Whiskie of course has its own terminology: dram, (wee) hauf and even a thocht. Aa/aw (all), a wheen (some), onie (any), eneuch (enough), hauf (half), baith (both) are used as in English. Baith and maist (see below) are usually used with the e.g. the baith/maist o thaim. Monie, mair, maist are the forms for countable nouns, muckle (or nowadays usually much), mair, maist for uncountable nouns , though colloquial Scots may blur this distinction. There is no a after monie, so ‘many a time’ would be monie time. ‘How many/much’ is Hoo monie/much? English ‘few’ is translated as nae monie, both fewer and less as less. ‘Too much’ is ower monie. ‘A few’ is a wheen, twa-three/three-fower etc. Larger amounts are expressed by awfie (a awfie midges), hantle (a hantle fowk), rowth (abundance). A dod o breid is a ‘chunk’. A crood is a large group of people or things and a curn is a small group. 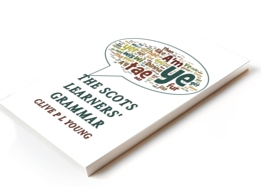 Scots compound nouns may be hyphenated to clarify meaning or pronunciation e.g. week-en, post-caird, twa-bedded (twin-bedded). The use of double nouns is very common in Scots e.g. tumshie hied (stupid person), baa heid (idiot), muck midden (dunghill, but usually used metaphorically), stair fit (bottom of the stairs), piece poke (sandwich bag), brae heid (top of the hill). Possessive forms as in English with -‘s which can also be used instead of -s’ with regular plurals bairns’s. The alternatively form with o is also used e.g. the convener o the meetin. Note the idiomatic use of the possessive in the morn’s morn (tomorrow morning), the morn’s nicht.